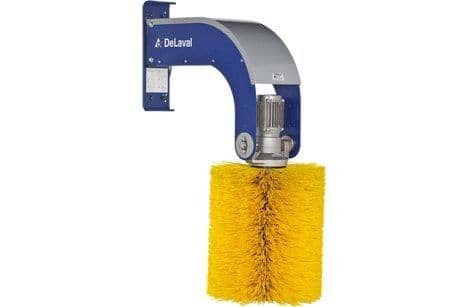 The DeLaval swinging cow brush is designed to improve cow health, comfort and welfare. The brush starts to rotate on contact at an animal friendly speed. It swings freely in all directions, smoothly up, over and alongside the cow. The bristles have the right length and hardness to stimulate the blood circulation whilst helping the cow to keep clean and calm. The exclusive design has overload protection against overheating and IP55 protection which enables the brush to be installed outside if desired. The energy saving automatic on/off feature starts the brush rotating on demand and stops it within 10 seconds after use. The brush is easy to clean with high pressure cleaners. This facilitates good barn hygiene. The swinging cow brush takes minimal barn space to operate in. Pre-mounted so it is easy to install, the cylindrical brush is suitable for wall or post installation. If it is installed in the right space in a loose housing barn, it helps the flow of cow traffic by guiding cows from the feeding area to the resting area. The springs are extremely strong and durable to secure a safe and smooth swing over action. The brush consists of 20 single brush segment rings - making it possible to replace single rings rather than the whole brush. The pre-mounted brush is easy to install and can be fitted in any loose housing barn or outdoors. It is suitable for cattle over one year old and should not be used by animals with long hair.